The standard VCO provides two CV inputs for pitch, an octave switch, four waveforms with separate outputs, pulse width modulation and hard sync. After the pre-heating time the VCO is stable in a range of 3.5 octaves. A basic VCO “workhorse” without many gadgets. The A-110-1’s frequency is set with a five-octave rotary switch and a tune control. For frequency modulation tow CV inputs are used, one with a characteristic of 1V/octave and the other with an attenuator for adjusting modulation depth. 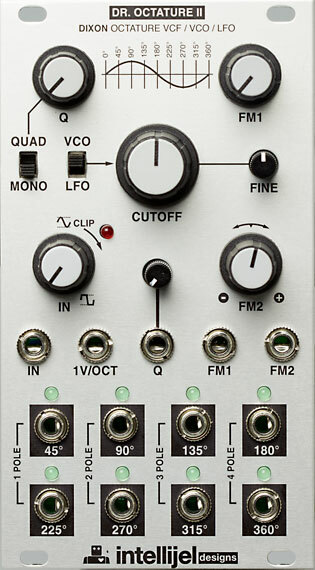 In addition the module is equipped with a Sync input for hard oscillator synchronisation. It generates the waveforms sawtooth, pulse, triangle and sine. Due to a control and two CV inputs the pulse width is variable from 0% to 100%, i.e. in maximum positions the signal will be cancelled.